If you have read the Seacliff High Series you are all set to enjoy Homecoming By The Sea. If you haven’t read the Seacliff High Series and don’t want to read it – no need to worry. I cover the backstory of the main characters in Chapter 1, Book 1, of the new series. I’ve tried to keep the backstory to a minimum so as not to bore those readers who have read the series but the information provided will be sufficient to enjoy the new series without having read the original series. I hope you will all try the new series. I am writing it this week and I have been having the best time with it. It is both funny and suspenseful with a small town feel and plenty of heartwarming scenes. The mystery is interesting and consist of many layers that will need to be unraveled in order to figure out what is going on. Those who have read the Seacliff High Series will be able to catch up with some old friends while meeting new friends along the way. I really think this will end up being one of my most popular series. Anyway, I’d love to hear your thoughts so comment below and let me know what you think. I will choose 1 winner from all the comments to receive a $10 Amazon Gift Card. 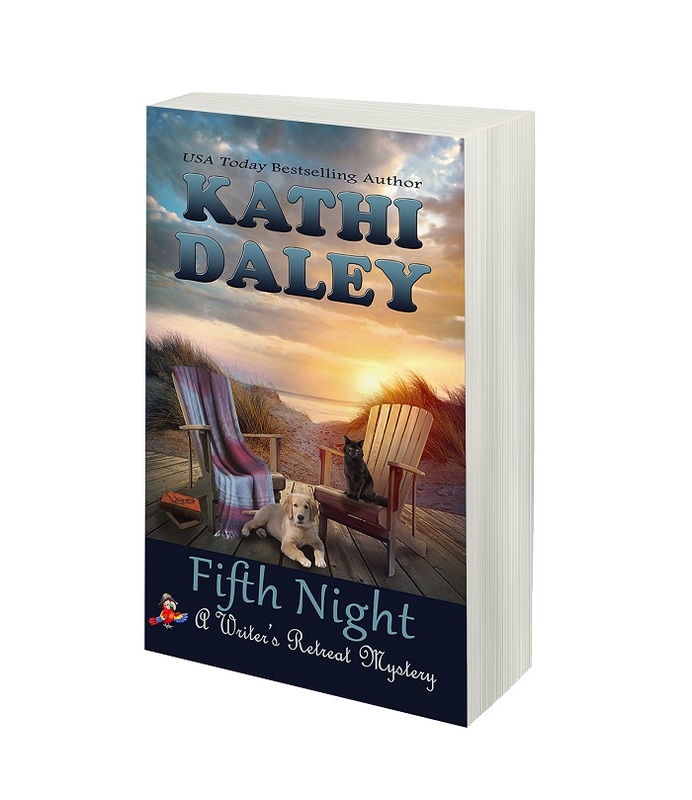 Fifth Night, book 5 in the Writer’s Retreat Series publishes on January 25. Here is a preview if you are interested. “Are you looking for a donation?” asked Alex Cole, a fun and flirty millennial who made his first million writing science fiction when he was just twenty-two. “So why are you here?” asked Victoria Vance, a romance novelist and my best friend. That seemed a pretty standard condition to me. “What exactly are you asking?” I wondered. I paused to consider her request. I didn’t know a lot about the case, but I did remember when Bobby Boston died. It seemed Deputy Rick Savage, Vikki’s boyfriend and a friend of the group, had been the one who investigated, and he’d determined there was no evidence to rule the case anything other than a suicide. Of course, I hadn’t known Rick back then; I’d just moved to the island when Abby’s husband had been found dead, so I didn’t have the background to have a firm opinion about it. “And you don’t think that was what happened?” asked George Baxter, Brit’s uncle, a mystery writer and the most senior member of our group. The group had been formed to look in to old cases that had been closed but seemed to still have unanswered questions. Abby’s case seemed like a worthwhile one to take on, but I wanted to leave that up to everyone. It was going to be hard to discuss the case with Abby sitting among us, so I called for a break, at which time I suggested to Brit that it might be best if Abby left. We would make a decision and Brit could let her know the following morning. I put on a fresh pot of coffee while Brit walked Abby out to her car. The case with which they’d presented us had the potential to become a highly emotional one for everyone involved. I hoped everyone, if they agreed to take it on, would be up to the task of finding the truth, even if it turned out it wasn’t what we were looking for. “What do you think?” I asked after coffee cups had been refreshed and the group had reconvened. I glanced at my half brother, Garrett Hanford, who was sitting next to Clara. He wasn’t a writer, but he owned the resort where the retreat was located and was therefore an honorary member of the group. “I’m in as well,” said George. “Me too.” Vikki glanced around the room with a look of determination on her face. I could sense Abby’s story had torn at her tender heart. Alex leaned back in his chair and crossed his arms over his chest, taking a moment to contemplate the situation. “Was the suicide note handwritten?” he eventually asked. Alex narrowed his gaze. I could sense his hesitation and I was certain Brit could as well. “Please? For Abby,” Brit added. I smiled at Jack, who was sitting across the room with his new puppy, Kizmet, at his feet. He was such a wonderful, caring man who really put himself out if he came across a person in need. “Does Wednesday work for everyone else?” I asked. “Are you cooking?” Alex asked. Alex just winked, then left the room. After everyone had returned to their cabin or room in the main house, Jack and I took Kizzy for a walk on the beach. She was an adorable golden retriever puppy Jack and I had found on the beach just before Christmas. While we didn’t know her exact age, we estimated she must be around five months old. I’d never been much of a pet person, and adopting a dog hadn’t been anywhere on my radar, but in the month Jack and I had shared parenting responsibilities for the easygoing yet rambunctious pup, she had firmly wormed her way into my heart. “Kizzy did really well at the meeting tonight,” I said as we walked hand in hand. “She didn’t try to chase Agatha once.” Agatha was Clara’s cat, who didn’t have a lot of patience for people, except Clara, or other pets. I watched Kizzy run up and down the beach ahead of us. It was such a peaceful evening. It had turned chilly, but the sky was clear, and there were a million stars overhead. The Turtle Cove Resort, where I had established the Gull Island Writers’ Retreat, had been in Garrett’s family for generations. While the resort initially had been run as a family vacation spot, I’d changed things up a bit after Garrett had his stroke and he asked me to run things. The writers’ colony was situated on a peninsula that featured ocean and sandy beaches to the east and marshland to the west. It truly was an exceptional piece of property, and I considered myself lucky to live here. I currently lived in the main house with Garrett and Clara, while George, Alex, Brit, and Vikki each had their own cabin. Jack, who had more money than he knew what to do with, lived in a huge mansion overlooking the sea, but he had plans to build his own cabin on the grounds so he could be closer to the rest of us. In addition to the members of the Mystery Mastermind Group, there were three other writers living in cabins. Nicole Carrington is a reclusive true crime writer who initially insisted on being left completely alone but has recently begun to soften up a bit and has even occasionally joined us when we get together for dinner. 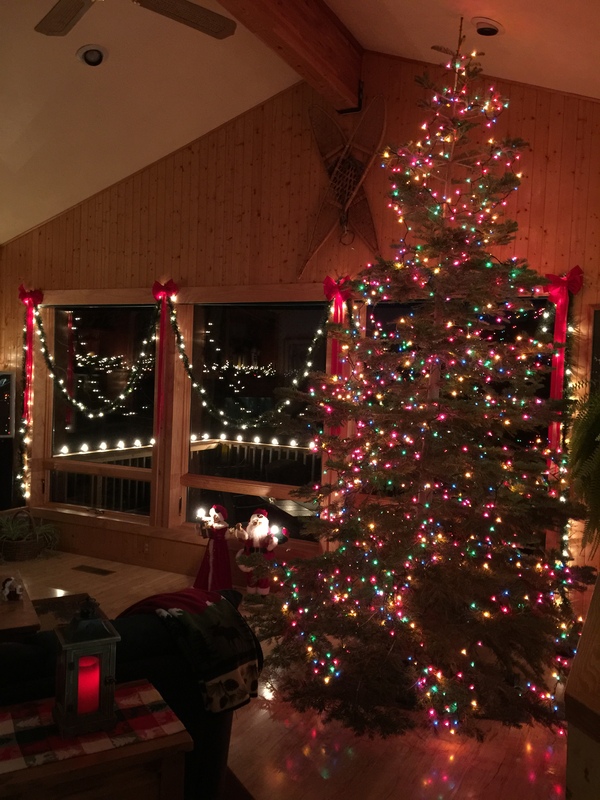 We also have two temporary residents, a historian who’s staying with us while he completes a book on the area, and a romance writer, who rented one of the newly refurbished cabins for the winter to write the first in a series of steamy novels. “How are the plans for that going?” I asked. 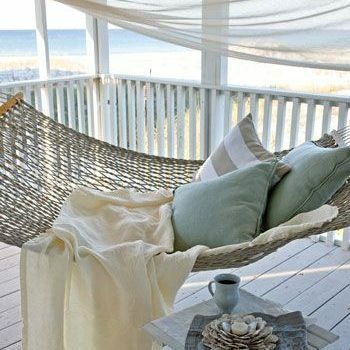 I hadn’t been sure it was a good idea for Jack to sell his mansion and move into a small cabin on the beach, but the more we talked about it, the more excited I’d become. Not only would Jack be living only footsteps away from me, but I would have more access to Kizzy as well. Of course, the downside of that living arrangement was that I’d recently started working with Jack at the newspaper. Would there be a point at which so much togetherness evolved into too much togetherness? “Your agent is your mother,” I remembered. Jack and I returned to the house, where he wiped the sand from Kizzy’s paws while I ran upstairs to grab an overnight bag with basic toiletries and clean clothes for the following morning. Although I hadn’t let on, I was somewhat nervous about Jack’s mother’s upcoming visit. She was important to Jack and Jack was important to me, so I wanted us to get along. When Jack spoke of his mother, it was with a tone that revealed both admiration and trepidation. I wasn’t sure what to make of that. He’d been just nineteen when he’d written his first best seller. His mother, who had a background in marketing, had quit her job to be his agent. Jack’s writing had always been a huge success, and I was sure at least a part of that was due to his mother’s work, but I worried what an overinvolved mother could do to our still-new relationship. 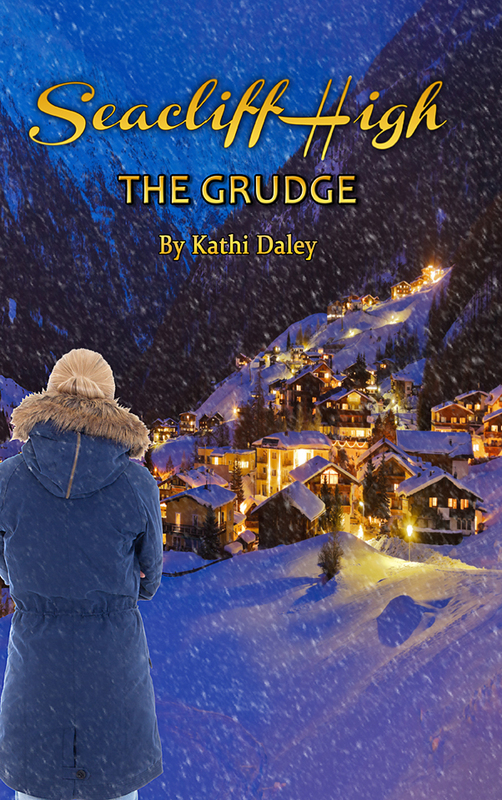 Jack seemed to be his own man, capable of making his own decisions, but I had enough of my own mother issues to understand that when it came to family matters that should be easy, they could have a way of becoming complicated in no time. A lot of you have been asking when the next book in your favorite series will be available so here is a tentative schedule for the first half of 2018. This is of course subject to change if need be. I will post the schedule for the second half of the year once I have it figured out. If there are updates I will post them in my newsletter so be sure to check the Upcoming Books section at the bottom of every issue. If you follow a specific series and you are behind in that series and don’t want to know the status of the characters involved, either skip this blog all together or skip over the series you don’t want spoiled. 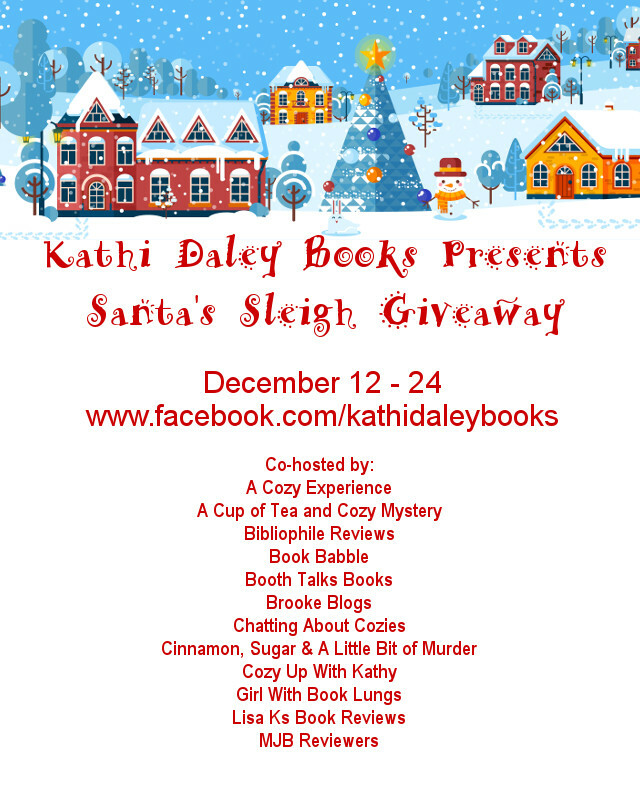 As we enter 2018 I wanted to give those of you who want a peek into the future of Kathi Daley Books an idea of where I am going with each of my 8 series. If you don’t want to know what is coming up you may want to skip this. My approach to this blog is gritty and honest. I will try to share with you the entire thought process I enter into as I make these decisions. As those of you who are caught up know, Zak and Zoe welcomed baby Catherine in Reindeer Roundup. I received quite a few emails from concerned fans of the series asking if Reindeer Roundup was the series finale. The answer is no. Zak, Zoe, and baby Catherine will have many adventures ahead of them in the upcoming years including at least 3 new stories in 2018. If you are wondering where I will go with the series next, to a point I really don’t know. I like to let the characters tell the story so until I write whatever is next I really don’t know the exact direction the storyline will take. What I do know is that I don’t want Zoe to be the sort of mom who is always putting her daughter in danger, so Zoe will have to figure out a way to be a good mother and continue to sleuth. I also suspect that Alex will begin to take on a more predominant role in Zoe’s sleuthing activities. The girl is a genius and I think it is a normal progression for Zoe to continue to ask her to help out with hacking activities when Zak is unavailable. The next book in the series will publish in late March or early April. It will be set at Easter and is tentatively titled Hippity Hoppity Homicide. As those of you who are caught up know, Cait and Cody are engaged, Siobhan and Finn are expecting a baby, Mrs. Hart is seriously dating a widower named Gabe, and Coffee Cat Books has a new employee, a pregnant woman named Willow. In 2018 we will see at least 3 new stories in which both Willow’s and Siobhan’s baby’s will be born. I’m still not sure if Cait and Cody will tie the knot in 2018. I guess we will both have to wait and see. I do suspect that Willow will hook up with Alex and both Willow and Alex will become semi regular characters. I plan to publish the next Whales and Tails in March. 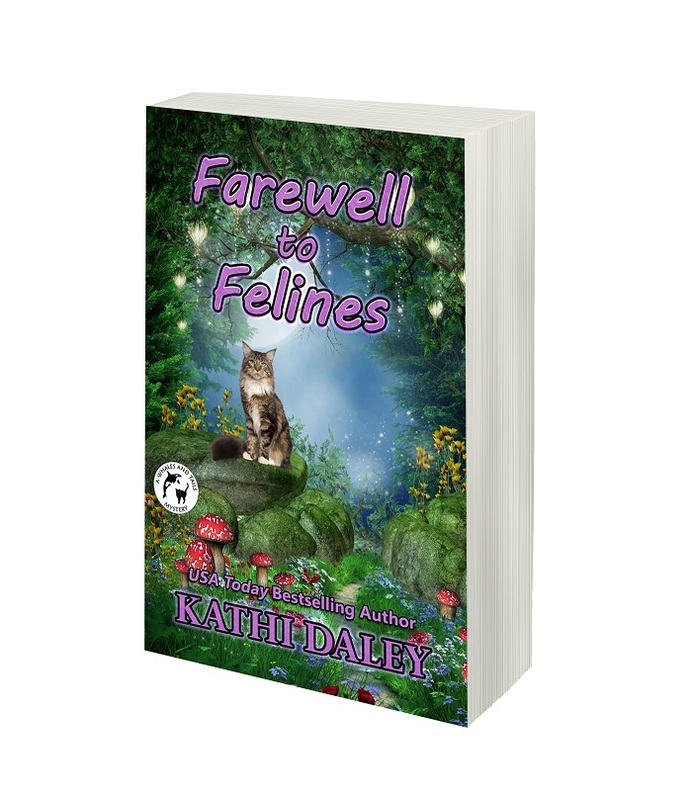 I was going to do The Cat of New Orleans but I don’t think I want to do a book on location when so much is going on back home on Madrona Island so I am going to push it back (again) and the next book will be titled Farewell to Felines. The story will deal with a strange phenomenon going on in the hollow (From the Legend of Tabby Hollow) which is causing all the cats to leave. I am so happy to say that book 1 in the new Tess and Tilly series was a huge success. I am pretty sure this will end up being my third bestselling series and have plans to do at least 3 more in 2018. 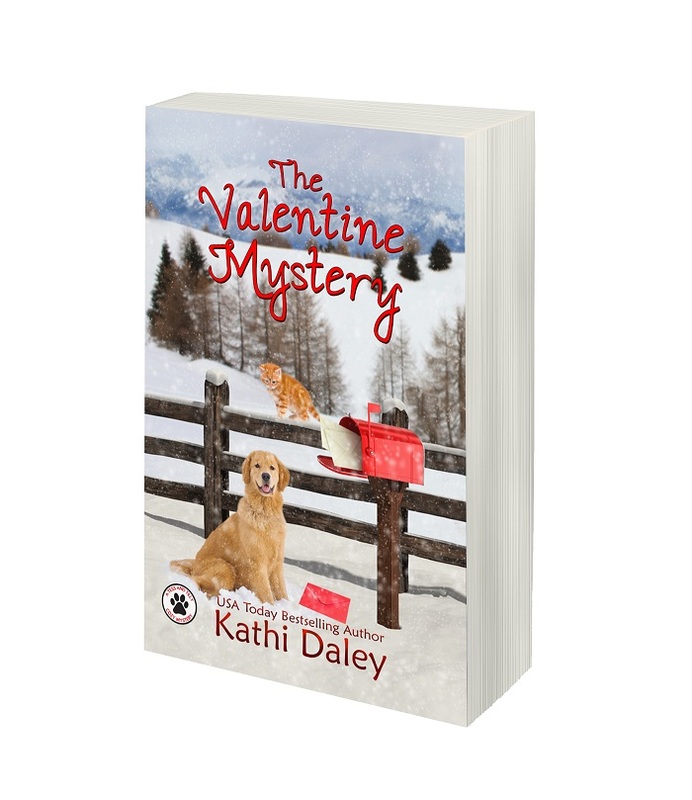 Next up in the series is The Valentine Mystery, which publishes on February 12 and is already available for presale. The series is too new for me to know exactly where the characters will end up but I will say that I am having a blast with the homey small town of White Eagle and the eclectic group of folks who live there. In book 2 we will see Tess coming into her own as a sleuth with the help of Bree, Tony, and of course Tilly. I am so delighted that the Writer’s Retreat series has been so well received. I have a lot of ideas for this series and plan to do 4 in 2018. 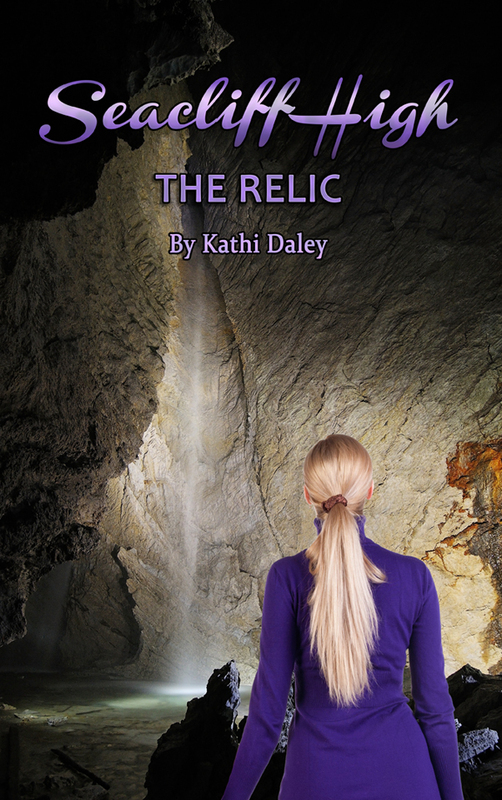 The next book in the series publishes January 25th and is already available for presale. It is titled Fifth Night and features the gang attempting to prove that a man who supposedly committed suicide was really murdered. The gang all join in to help the widow of the man who died as she attempts to raise her sisters four children with one of her own on the way. Blackbeard isn’t in this story as much as some of the others but you can be sure he will continue to jump in and help from time to time. This book also gives us a glimpse as to what is going on with Nicole. It is a bit early to really tell how this series will do. It was received well enough for me to continue so I plan to do two to 3 new stories in 2018. The characters in this series feel the least known to me and I really have no idea how it will all work out. My favorite part about Finding Justice was the appearance of Shredder and I may bring him back in upcoming books. The next book in this series will publish in April and is titled Finding Answers. As most of you know I signed a contract with Henery Press for this series. Books 9 and 10 in the series will publish in 2018. Beaches in Paradise will publish in June and Turkey’s in Paradise will publish in November. Turkey’s in Paradise is the last book under my current contract. I am undecided at this point if I will continue. As you may have figured out I am presenting the series in order of sales status, and the Tj series doesn’t really stack up as well as some of the others. What I will say is that I know I have some diehard Tj fans out there and I will think very carefully about this decision whichever way I go. In the very least you have two new books to look forward to in 2018. The Sand and Sea Hawaiian Mystery series never really got a foothold for some reason. I really tried to find new readers for the series since there are those of you who love spending time with Luke and Lani but the sales numbers have been ho-hum. At this point I do not have any specific plans to write any more books in this series. If I do decide to give it another try I am going to change it up a bit. At the end of the last book we see that Lani and her father are going to open a detective agency. If I do write new books I am going to rebrand it as Pope and Daughter Investigations. The titles and covers will change to a slightly different theme as well. This is still in the maybe pile so I will let you know if I decide to move forward. Seacliff High is one of my personal favorites and I have many VERY committed fans but the sales numbers simply do not justify continuing. By the time I pay for editing and a cover I don’t even break even with this series. I think the problem was never the stories themselves, but the fact that I suspect that a lot of readers thought the books would only appeal to teens so they never really gave them a try. I do have an idea to rebrand this as an adult paranormal series. If you have followed the series I would like your feedback on how well you think this would work. Here is the concept: We rejoin Alyson, Mac, and Trevor seven or eight years after the last book in the Seacliff High series took place. Since that time Alyson and her mom have moved back to New York where her mom returned to her old life and Alyson went to college. We also find that Mac graduated college with a degree in computer science and currently works for some big name tech firm in California making a boat load of money, and Trevor has remained behind in Cutter’s Cove and now owns Pirate’s Pizza. 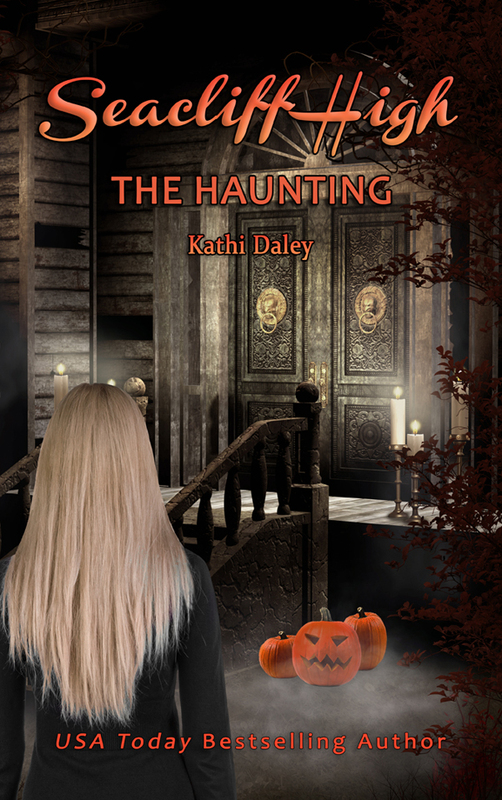 The first book in the new series opens with Alyson finding out that Booker has been murdered. A period of time has passed and the murder has not been solved so Alyson feels that she owes it to the man who did so much to help them out while they were in high school to go home and find his killer. Alyson’s mom still owns the big house on the bluff overlooking the sea, so Alyson returns there. It has been vacant for seven years but it is still livable. After Mac hears that Alyson is back in Cutter’s Cove she takes a leave from her job and returns as well. She moves in with Alyson for the time being. 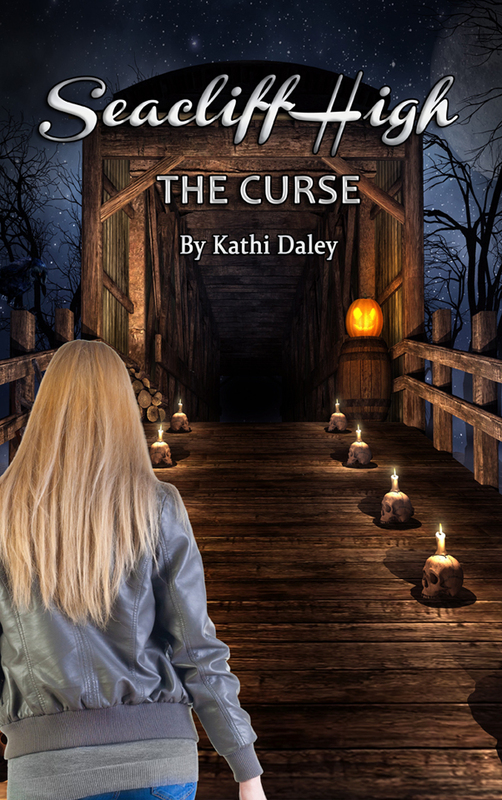 Alyson not only realizes that she had been missing her old life more than she ever realized, but she also realizes that while she could no longer see ghosts while in New York, as soon as she returned to Cutters’ Cove her old gift came back. In fact it is ghost Booker who helps her solve his own murder. At the end of the book Alyson decides to stay in Cutter’s Cove. Mac had been wanting to start her own software firm so she stays as well and moves in with Alyson. Alyson, Mac, and Trevor are back to mystery solving in Cutter’s Cove with the help of ghost Booker only this time as adults. Booker’s home has been donated to the historical society and he continues to live there (as a ghost) – the caretaker is Booker’s niece Monica. 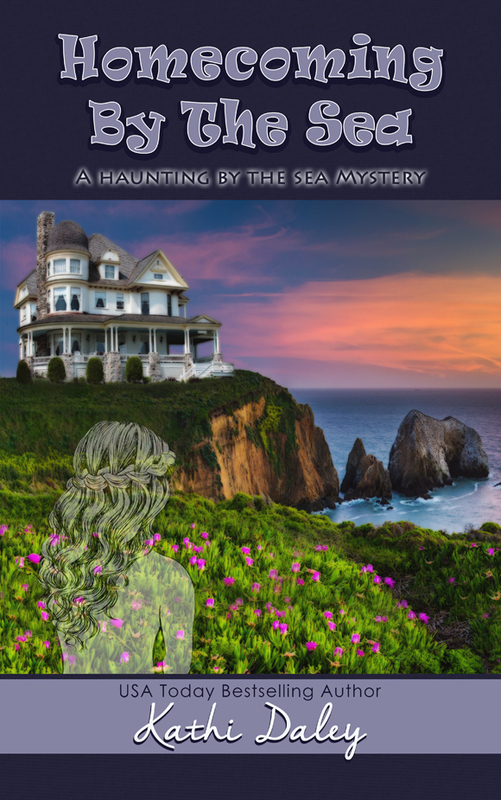 The series title would be: A Haunting by the Sea Mystery – possible titles include: Homecoming by the Sea, Murder by the Sea, Secrets by the Sea, etc. 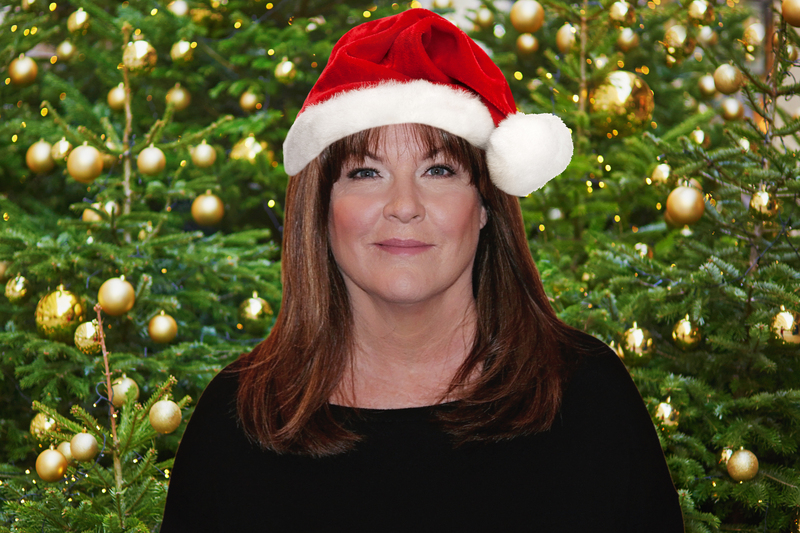 Happy Holidays everyone. This weeks blog will be short and sweet, more like a tweet, since I have SO much to get done in the next few days but I want you all to know how very much you mean to me. I am looking forward to an awesome 2018 with a lot of new books coming your way. I hope to have a partial schedule in a week or two. It’s finally here! 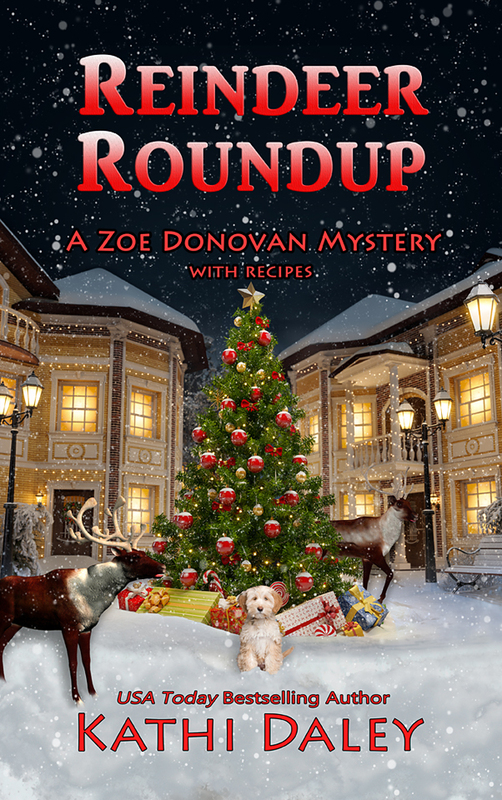 A very special Zoe Donovan Christmas Mystery published today. A sneak peek is provided below. I wasn’t sure exactly when the fog had rolled in, but I was having the darnedest time trying to figure out where I was and what it was I was supposed to be doing. Even though the fog was so thick I couldn’t clearly define the images surrounding me, I could see red and green blinking lights overhead. I closed my eyes as nausea gripped me. I tried to focus and figure out what was going on, but the sound of “Rudolph the Red-Nosed Reindeer” blaring through loudspeakers was so jolting it caused my head to pulsate in time to the music. I had pretty much convinced myself I was trapped in some sort of Christmas nightmare when I heard the voice of my best friend, Ellie Denton. I tried to focus on her voice, but it seemed so far away. Ambulance? Maybe I really was trapped in a nightmare. “I think she’s coming to,” Ellie assured someone as the fog began to lift. I realized I was lying on my back on a hard object. Maybe the floor. 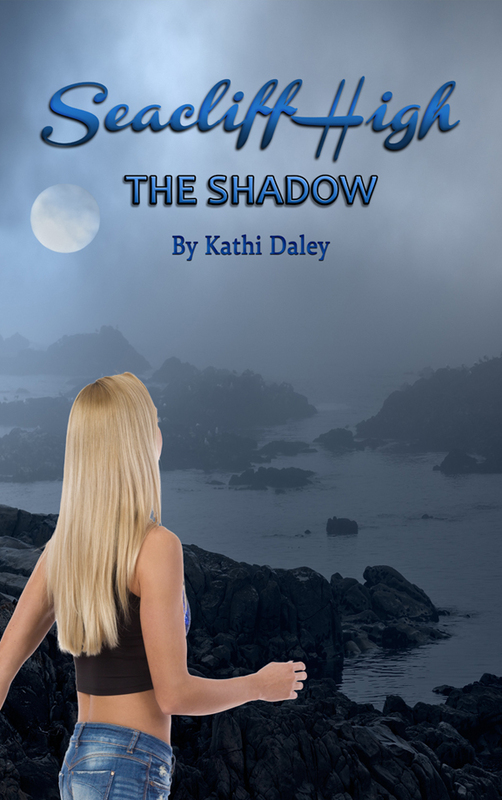 I didn’t have a clear sense of where I was or how I’d come to be there, but I could feel Ellie’s hands stroking my hair as I made my way through the murky landscape toward the voice that was pleading with me to open my eyes. “She’s opening her eyes,” Ellie screeched. I cringed. My head felt like I’d partied way too hard and Ellie’s happy chirps of relief weren’t helping. Baby? I reached down and touched my swollen stomach. Oh God, Catherine. “Are you sure Catherine’s okay?” I croaked, barely able to find my voice. As it turned out, lying still was all I felt up to, so I happily complied. I could hear people moving around, but it seemed like too much of an effort to open my eyes, so I simply allowed myself to drift into the space that exists between sleep and wakefulness. As I waited for whatever would come next, I let my mind wander wherever it chose in an attempt to block out the chaos around me. I’d been Christmas shopping with Ellie and baby Eli. 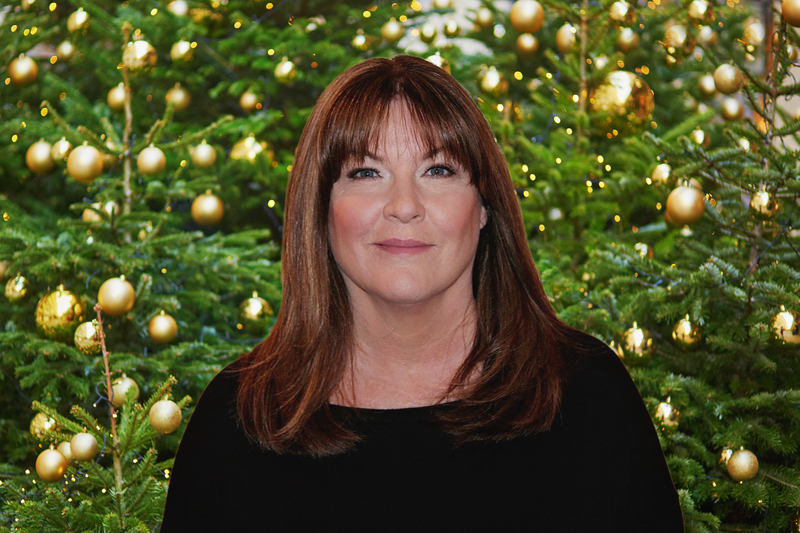 We’d been marveling at the lavish holiday decorations the department store had set out this year when Ellie noticed a Santa sitting in a big red chair listening to the wishes of the boys and girls who’d been waiting in line. Ellie wanted to get a photo of Eli with Santa, so we’d headed in that direction. I remembered being a little sad that Catherine wasn’t with us this Christmas, while at the same time being excited about what the new year would bring. I remember being worried, but for the life of me I couldn’t remember why. I do remember the fear in my heart had caused me to become distracted, which is probably how I tripped over the elf in the first place. “The ambulance is here,” someone said. I could hear rustling and shuffling but decided it still wasn’t worth the effort to open my eyes, so I just lay there and waited. I cringed as my eyes closed tighter. Suddenly, I remembered what it was I’d been distracted by. I wasn’t sure how long I’d been asleep, but when I next opened my eyes Ellie was sitting in the chair next to the bed I was lying in. I was hooked up to so many monitors I couldn’t begin to figure out what they were measuring, but I felt a lot better, so I hoped everything was fine. The doctor came in to do an exam as soon as Ellie left. I lay quietly, trying not to worry about my husband and the internal struggle we’d both been dealing with since we’d learned of his mother’s accident. Any way you diced it, it was my fault Zak’s mother was lying in a hospital in Paris, France, with serious injuries. No, I hadn’t been driving the automobile that had run her down, but the only reason she was in Paris and not here, safe in Ashton Falls, was because she’d wanted to spend Christmas with us, I hadn’t wanted her to, and Zak had wanted to make me happy. 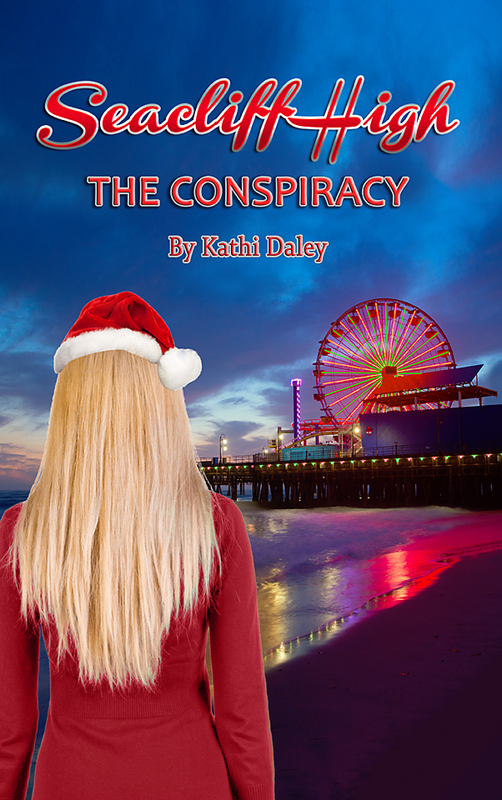 He knew reasoning with his mother wouldn’t work, so he’d sent her to Paris for Christmas as some sort of a bribe. Had there ever been a worse daughter-in-law than me? “Are you feeling any pain?” the doctor asked. I noticed my cell phone on the nightstand next to the bed. I picked it up and checked for messages. Although it was after six, I realized I hadn’t checked my phone since before Ellie had picked me up for lunch and shopping. There were eight texts and two voice messages, but nothing from Zak. I figured he should have landed in France by now and would have called, but I supposed he had more important things on his mind. The first text message was from my mom, asking me if I had any news on Zak’s mom. I texted her back, letting her know I hadn’t heard anything, but I’d let her know as soon as I did. I considered telling her about my own elf accident, but I knew she’d just worry, so I decided to wait until I was safely home before mentioning anything about it. The next text message was from a woman named Stella Green. I’d gone to high school with her, but we hadn’t stayed in touch, so I didn’t consider her to be a close friend. The text just said Call me, so I skipped it and went on to the next. The third text was from the Christmas store in town, letting me know the custom ornaments I’d ordered had come in and I could pick them up at my earliest convenience. I was excited to see how they’d turned out, so maybe I’d ask Ellie to pick them up for me. The fourth text was from Stella again, asking me to call her and adding the words it’s really important to the end. I once again skipped over it, figuring I’d call her after I got home. The fifth text was from Scooter, asking if his friend Tucker could spend the night. I realized he’d texted before he knew I was in the hospital, but I decided to text back anyway, letting him know I was doing fine but he’d need to take a rain check. The sixth text was from my grandfather’s girlfriend, Hazel Hampton, asking if I was planning to participate in the cookie exchange this year. Knowing Ellie, she’d already made cookies for us both to bring, so I texted back to let her know I planned to attend and wanted to confirm the exchange was still scheduled for Tuesday. The seventh text was from my mom again, asking if I wanted her to make a Christmas stocking for Catherine. I texted back that Catherine wasn’t due until three weeks after Christmas, but if she had time and wanted to do it, we could always use the stocking next year. The last text was from Alex, asking if I was okay. I guess Levi must have told her what was going on. I told her I was fine, but they wanted to keep an eye on me, so I was staying the night. I told her I’d call her later. Both voice messages were from Stella. The first said she’d been getting strange emails and she wondered if Zak could help her track down the source. The second message sounded a bit tenser, as she asked me to please get back to her right away. I was about to call her when Ellie came in. “So, everything went well?” Ellie asked. “I know you’ll be fine, but I’m not leaving until they kick me out.” Ellie noticed the phone in my hand. I wanted to respond that I was sure he would, but I really wasn’t so sure. I couldn’t get out of my mind the haunted look on his face when he’d first received the call from the hospital in Paris. He’d looked so lost and scared. I wasn’t used to my big, strong husband looking like a terrified little boy. I closed my eyes, fighting back my own tears. Zak had rented eight reindeer for the Hometown Christmas event that would be held from five p.m. on December 22 until five p.m. on December 24. The reindeer were in a pen on our property for the time being, but the events committee planned to truck them to a pen near the Santa’s Village, which was currently being erected for the annual event. As I closed my eyes in an attempt to fall asleep, I tried to focus on all the good things in my life. My wonderful husband and three honorary children. Pi was Zak’s ward, or at least he had been before he turned eighteen. Currently, he was more of an assistant and would work full time for Zak once he finished college. He planned to come home for Christmas once he finished his last final on Wednesday. Scooter was thirteen and had first come to us when Zak agreed to babysitting duty after his mother died. Eventually, Scooter had come to live with us as well, and on a magical Christmas three years ago he’d brought with him his best friend, Alex, who had captured my heart the way no other child ever had. Alex was a brilliant and mature thirteen-year-old with a heart as big as creation. Last year she’d founded the Santa’s sleigh program, collecting toys and food for those in need and then distributed wrapped gifts and food baskets a few days before Christmas. And then, of course, there were the four-legged members of the Donovan-Zimmerman household. My dog Charlie, Zak’s dog Bella, Scooter’s dog Digger, and my cats, Marlow and Spade. Alex seemed to have a revolving door of animals she fostered, but right now all the animals that had been in her care had found forever homes. And last but not least, I was blessed with the best friends in the entire world, Levi and Ellie. They’d been my friends for most of my life and I considered them family. As I drifted off to sleep, my thoughts changed to baby Catherine, who would soon make her entrance into the world. I didn’t say so to Ellie, but even though Catherine wasn’t due until after the first of the year, I’d gone ahead and bought an ornament for her just in case she decided to make an early appearance. I’d been having a few contractions in the past week and the doctor has assured me Catherine was fully developed, so if she did decide to arrive a couple of weeks early everything should be fine. It was strange, because one part of me was anxious for her arrival and another was terrified.